This page may require cleanup to meet basic quality standards. The specific problem is: Different available controllers, outdated/404 links, etc.. You can help by modifying the article. The discussion page may contain useful suggestions. Controllers can be used wired connections (via micro USB) or wirelessly with Bluetooth or the Xbox Wireless Adapter for Windows (supports up to 8 controllers). Xbox One Elite Controller includes more features compared to regular controller, including replaceable sticks and d-pad, four paddle buttons to back and fully rebindable button layouts. New revised controller variation was released along with Xbox One S, which includes Bluetooth connectivity. Connecting the controller should automatically download and install latest drivers for the controller. Use the Xbox One Controller Enabler. 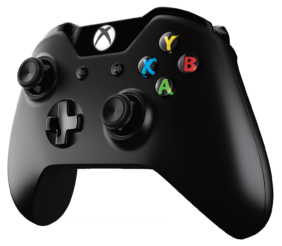 The Xbox One Controller is natively supported by distros using Linux kernel 3.17 (or later). Vibration is currently not supported. Only newer variations of the controllers are build in to support Bluetooth. See this official support page to distinguish the supported models. Windows 10 with Anniversary update is required. It's recommended to only connect single controller with Bluetooth connection. Some accessories like headsets and chatpads do not work using wireless connection. Press and hold the controller bind button between shoulder buttons for 3 seconds until Xbox button starts to blink. On Windows 10, access bluetooth settings (Settings → Devices → Bluetooth), select Xbox Wireless Controller from the list and click Pair. To shut down the controller, hold the Xbox button for 5 seconds. Supports up to 8 controllers. Connect the wireless adapter to PC and press the pair button. On the controller, press the controller bind button between shoulder buttons. Some games have issues with the Xbox One Controller. Refer to the individual game pages for details. Install Force Feedback Driver for Xbox One Controllers. Some games will still not support vibration even with this installed. Open Windows Update and ensure KB2685811 is installed. Either Windows 10 PC with the App or Xbox One is required to update controllers firmware. To update firmware on the controller, install Xbox Accessories App from Microsoft Store and connect the controller either with cable or wireless adaptor.